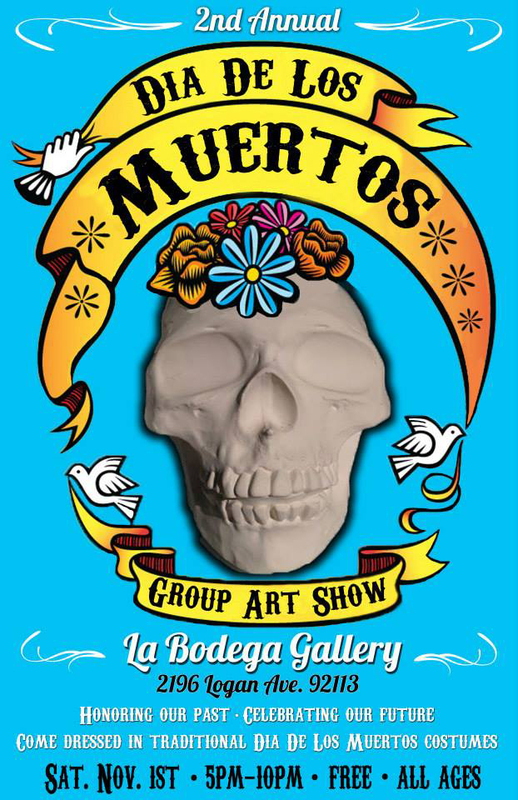 "Past" Dia De Los Muertos group Exhibit at La Bodega Gallery in the Barrio Logan neighborhood of San Diego, Ca. Thanks to all who came out to celebrate Life, Family, Community, & the Arts at the 2nd Annual “Dia De Los Muertos” Group Art Show. Featuring over 50+ Artists, Live Music, Community Altars, Face Painting, Food and much more!! ** Please feel free to come in traditional Dia De Los Muertos costume/makeup!! Día de los Muertos (English: Day of the Dead) is a Mexican holiday celebrated throughout Mexico and around the world in other cultures. It is believed that the spirits of the dead return to earth for one day to be with their loved ones. The Day of the Dead is a way in which the living remember and honor their departed relatives and friends. Each talented artists will be decorated a ceramic skull like the one on flyer! !